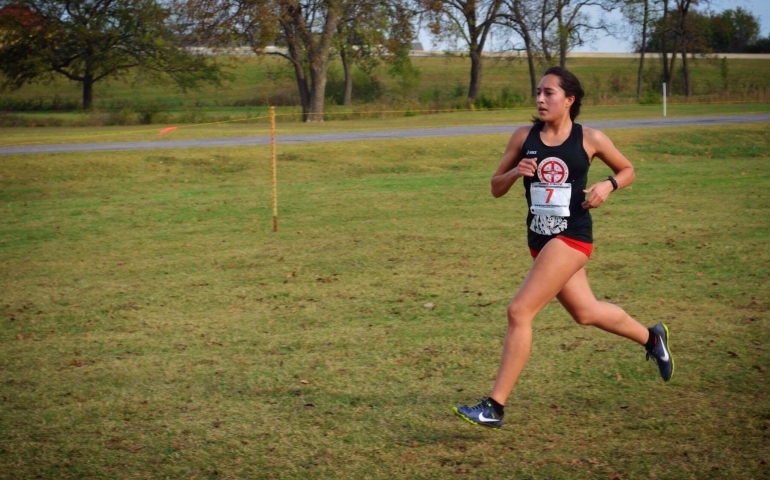 Nancy Jurado, a member of the Track and Cross Country team at Southern Nazarene University (SNU), is an Early Childhood Education major in her junior year. After spending her first few years of college at Bacone College in Muskogee, Okla., Jurado transferred to SNU this year. She ran with a small team of four girls at Bacone College. Her team lost too many team members in the end, resulting in the inability to compete as a group and forcing her to leave cross country momentarily. Jurado was born in Mexico but moved to the United States when she was just two years old. She is a proud informed Deferred Action for Childhood Arrivals (DACA) recipient. Jurado’s DACA allows her to legally work in America, attend school and run track and cross country at SNU. She grew up on the southwest side of Oklahoma City where she attended Santa Fe South High School. In 2012, Jurado ran in the all-state meet in Texas for the cross country discipline. “I got to represent the state of Oklahoma in Texas and run against Texans,” Jurado said. Because of this accomplishment and her experience in cross country, she earned several scholarships at both Bacone College and SNU. Outside of cross country, Jurado enjoys shopping, watching TV and movies, and traveling. She has visited Turner Falls, the Arbuckle Mountains, and has gone river-floating in the Illinois River among other adventures. “I’ve been to Destin and Panama City in Florida, and I’ve gone to Arlington Six-Flags four times,” she said, adding to the list. Her love for travel is reflected in why Jurado chooses to run in cross country. When she was asked if she had to pick between track and cross country, Jurado would choose cross country because, she said, “There is different terrain and different scenery, and I am better at distance than speed.” Track is not her first choice because she would rather see the world around her than run in circles on a track. Jurado will be running in SNU’s next cross country meet, held at Oklahoma Baptist University in Shawnee, Okla. this Saturday, Oct. 6.